Ed’s note: Kerry-Jean gave us so many beautiful creations that we wanted to show her off a little more. Look out for Part 2 on Friday! The card: a little bit of art you can give to someone special. I love making cards and all of them are different except for a general style that can be found in them all. The thing that I find amazing is there are so many different card styles, that really you can never get bored. Stumped yes, but not bored. One of my favourite card styles is the easel card — and it is so simple. The best thing about this style of card is it is designed to display itself. How awesome is that? 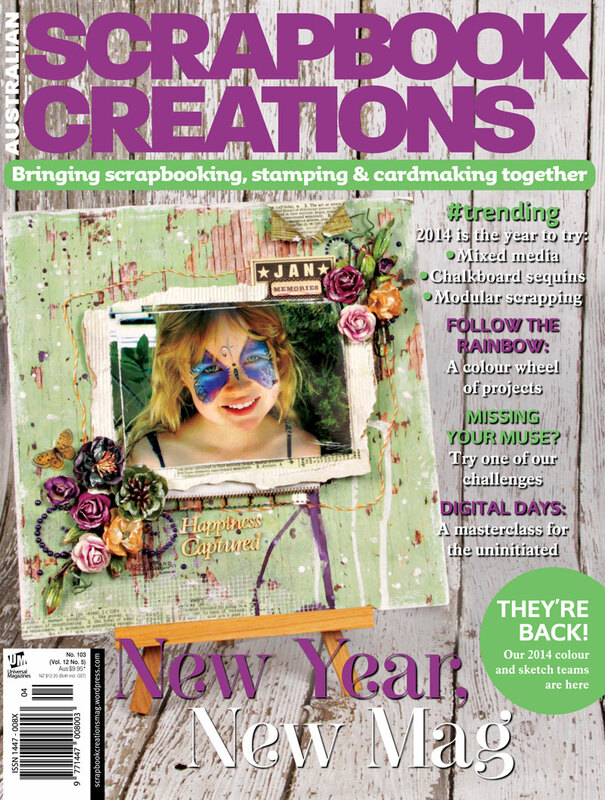 I think one of the keys to making great cards is the sparing use of vibrant colour and textures. I try and use 2 or 3 different patterned papers and no more, otherwise it gets a little crowded or busy. Take this butterfly card for example (below), it has a lot of things happening on it. There are the bird cages, the butterflies and the flowers, but the paper for the background is just black and white. Granted I have chosen a rather ornate designed paper but it still sits behind all the activity. I was going for a Season of Spring feel with this card and who cannot go past putting some butterflies on a card like that? Having the acetate means that with the easel card I can really achieve flight for my butterflies. Having a few flowers and small leaves just grounds the entire design and finishes it off nicely. Choosing an anchor for the easel can be a bit tricky, as I could have gone with more butterflies or flowers, but then I feel it would have just been too much. 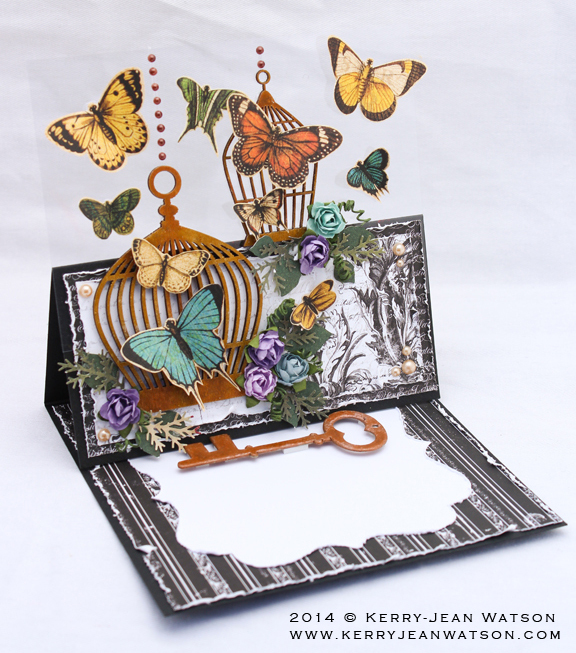 The choice of the key works with the bird cage and butterfly motif used, as it is simple and balances out the design. Now I don’t know about anyone else but I am loopy for steampunk. Cogs, gears, Art Nouveau, butterflies and flowers! It is heaven. I just haven’t done a lot in the style in fear of doing it an injustice. Sometimes, though, a collection is released that you just have to work with. I love the colours of Graphic45’s Steampunk Debutante Collection, and burnt orange and turquoise really work well together. Gears and cogs are integral in the steampunk motif and many companies have these available in either chipboard or wood veneer now, which is really awesome. To grunge them up, I paint the chipboard or wood black first and then, either using paint or ink pad, dab little areas of bronze, copper and silver. This will give your embellishment that mottled rusted grungy look. Having the acetate attached to the card means you get that beautiful silhouette of the gear embellishment. Using mediums over the paint can add more effects, for instance I have used a crackle medium to “age” my gears a little bit more. The Art Nouveau poster image that I distressed and curled the corners of, really needed to be complimented by some flowers. If you find, like I did, that the flowers you have just aren’t quite the right colour, use a spray or some watered down acrylic paint to get the colour you want. Flower placement isn’t a science, it really comes down to balance. The rule of thumb is to place them in an odd number, a rule I don’t follow all the time. I like to use flowers to frame something in the design or to add a little dimension. I also tend to only put one or two sprigs of leaves to a flower bunch as there is no need to over crowd the flowers. Wow!!!! This is stunning Kerry-Jean. I am so going to use the idea of things floating on plastic sheets I love using plastic sheets but this is truly spectacular. Well done. Be sure to check out Part 2 later on this week. Thank you too for the compliment. Looking forward to seeing part 2 soon.